Unless I misread it, the developer is the owner of the site, not the Council, he bought it a few years ago for £600,000. He has hinted that he might just pull out and try and re-sell it, although given the limitations imposed on it by the Sheerness Society and SBC, it could be hard to find someone willing to spend his money appeasing them. Well I am glad it has been retained, but I do hope that it can be utilised instead of being left to decay and creating an "eyesore" due to its dereliction. Maybe now people can put some effort into putting pressure on the owners (council?) 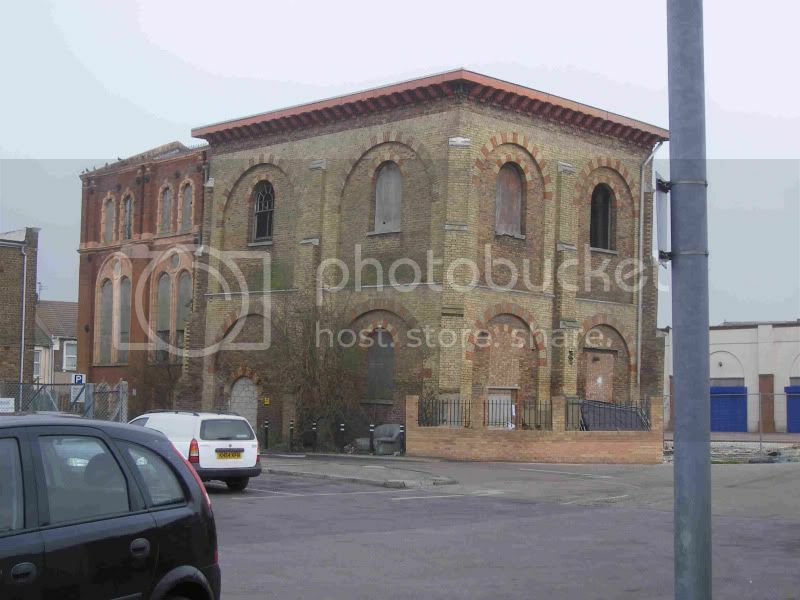 to use the building and improve this area of Sheerness. If this building was utilised and cared for then the old Alldays shop may be cleaned up or removed which will improve the whole area. 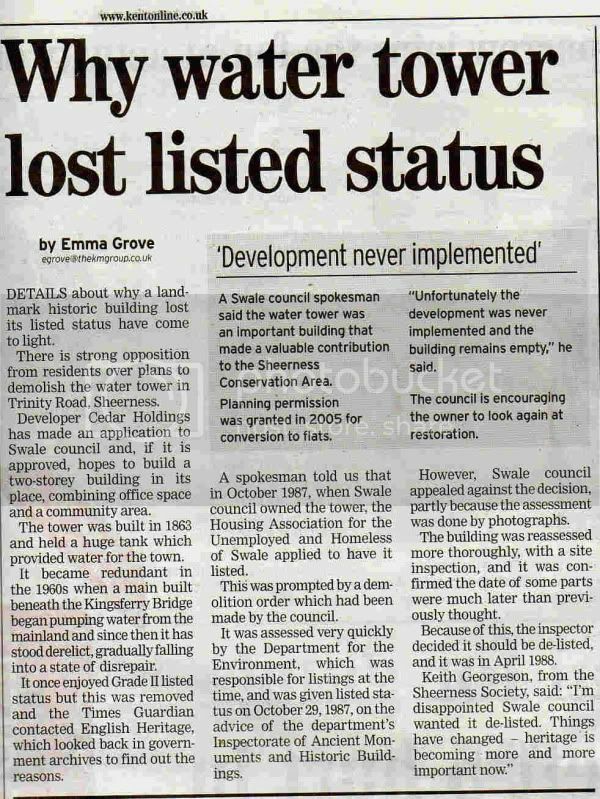 I notice in today's Sheerness Times Guardian that pretty much as expected, Swale Borough Council have refused permission for the Water Tower pigeon loft to be demolished. I find it ironic that in the same paper most weeks, SBC are regularly looking at ways of trying to regenerate Sheerness town centre and yet they refuse permission for this eyesore to be demolished and be replaced by building that would greatly improve the area. It was also interesting to note the comments of one "keep it there" campaigner who ended her comments on the success of the victory with the statement "yes, its been saved but what happens next". What will happen next, if, as the owner suggests, he walks away from the site in despondency, is that the victory will ensure Sheerness has to endure this eyesore for many more years to come, especially as a photograph this week would suggest that one of the buildings is subsiding. Obviously the majority of following postings on this matter will be to celebrate this "victory", but the campaigner's comment mentioned above needs answering, or is that it, job done, let's move on to blocking any change to any other old building in Sheerness. Its all right this minority group doing their best to revert Sheerness back to its glory days and trying to re-create old photographs, but they seem to be missing the point, in that most of the people with the money capable of buying the buildings are only interested in moving them forwards, not backwards. History, and in this case, future history, will prove which of us was right or wrong, but I hope that in even ten years time, the Water Tower isn't still a derelict pigeon loft because of this "victory". I had noticed the subsidence, I think this gives the answer from the application! In our local paper 'The Sheerness Times Guardian' this week it stated that a decision was to be made by the council on Thursday as to if the go ahead would be given to demolish the old water tower..does anyone know the result? I'm too busy, Minsterboy no comment. For Hutch to call the Water Tower a town centre landmark beggars the question, what kind of landmark, clearly it stands out but why? Some buildings do have value for their looks and are worth saving but come on, that monstrosity! And do the rest of Sheerness and indeed Sheppey, agree with the sentiments of a small minority, has anybody asked them, who are the Sheerness Society speaking for? A small minority of people thought that Tracy Emin's crumpled and stained bed was a valuable piece of art but I doubt a majority would of. If the majority of people in Sheerness said that they wanted the Water Tower to remain there you wouldn't here from me again. But I rather feel that we have a small minority of people who seem to have decided that they speak for Sheppey as a whole and because ordinary citizens can't be bothered to give alternative opinions, the Council feel inclined to cede to the demands of those who shout loudest every time. Clearly I can only form my opinions on what I know, which is very limited, and how I feel and if, as Hutch suggests, there are those such as he, that have superior knowledge, then why not put that into the public domain so that us, or perhaps just me, that might have alternative views can form better judgements. Or is it simply a case of keeping it to yourself so that you can more easier win another stay of execution that satisfies the opinions of a few but is not necessarily supported by the majority. I would also ask the question, when as you presumably would of known, you knew a developer was planning to buy the site, did you make it clear what objections that you would be putting in his path so that he would have a fair opportunity to not purchase it. Finally, as I am clearly not party to the knowledge that an offer has been made on Shurland Hall, then I am overjoyed to hear it. The money spent on a building that is recognised by the majority as of truly historical significance, will not have been wasted. Interestingly as well, if the Water Tower is saved and turned into whatever the Society want for it at the developer's expense, I wonder if an Open Day was held, if it would attract the same crowds as turned up for the Open Days at the Shurland Hall. The History of the Tower , or pumping station as it would be better described is not well documented. This is true of many industrial or municipal buildings built for purpose and in more recent times without grandeur. This makes it easy to dismiss such architecture as unimportant, or redundant allow it to slip into disrepair and create a good argument for destruction. When such a building, has the potential to have been created by Engineers, Architects or Builders of National Importance do we not have an obligation to ensure this is not the case before sending in the wrecking crews? With the Historic Dockyard so close, and the building so important in the development of Sheerness from a Parish of Minster to a Town in its own right do not underestimate how significant this structure is. At the time this building was built, very few Engineers had the expertise to create such a system which required knowledge not just of Architecture but Steam Engines and Pumps as well as foundation work in less than ideal land conditions. It is well documented that shortage of water had prevented the viability of Sheerness Docks expansion despite the well at what is now the Sheerness Steel works. The Battle of Trafalgar 1805 had brought dockyard review back to the fore and John Rennie had designed dockyard improvements before his death in 1821. His sons George and John Rennie went on to complete his vision by 1826 but little is known about how the lack of water was suddenly overcome. John Rennie (later Sir John Rennie) is known to have visited the Pumping Station in 1862 after the pumphouse and tower collapsed, the cost for repair 3000 pounds. Sir John Rennie retired in this year which would have made this one of his last commissions. George Rennie was responsible for similar Pumping installations in Chatham Dockyard which I am sure no-one would allow to be demolished. I have collated much information on the water system at Sheerness, the dates of the three wells, the timing of the connection of Sheerness to mains water, the Cholera and Typhoid data, the delivery of water by the Co-operative by Donkey, and lack of supply all indicate that the Pumping station (and Tower) were most likely primarily for the Dockyard Developments. The connection with John Rennie and sons is further likely when consideration is given to the need for Boulton and Watts steam (beam) engine and pumps. John Rennie was commissioned as preferred engineer by Boulton and Watts for the Albion Flour Mills, a project which dramatically reduced the cost of the daily loaf, and saw the introduction of cast iron cog wheels in place of the previously used timber. Many of Rennie's projects were water pump related, especially where land reclamation and drainage was required. The timing, expertise, figures on well and pump yields combined with documented domestic supply problems, all indicate that this installation was for more than domestic supply. The size and height of the tank more indicative of supply to the steam engines than to supply mains pressure (0.45 psi per foot above sea level i believe). The pictorial evidence of the missing tank long before the connection to the mainland in 1960, and timing of domestic connection in 1864 all contradict any claims this is just a derelict old Water Tower. There are many more points, and references too numerous to mention here, but I hope this in some way lays a case for thorough Heritage Surveys before any thoughts of demolition. Remember most of the required proof may not be in the public domain so if we adopt an "its not fit for purpose so get rid of it" attitude a lot of opportunities to regenerate through Heritage and History will be missed. Yes we need progress but we also need to respect our past. Fair enough, I'll say no more on that subject. My apologies Kyn, having just re-read the Guidelines I realise I had previously missed the piece that states that the Forum is based on facts and not opinions, which clearly my replies were. Can I remind you all that there are guidelines to the forum, and unpleastentness is not accepted on here - before this gets out of hand. We are all entitled to our opinions and we all have a right to stand up for what we believe in, lets keep it to the proper channels though! I find it hard to understand Minsterboy, it seems to me, he thinks knock something down because its old, build new houses to accompany lots of unused and unwanted others, as Sheerness is in his opinion beyond help and a total mess, then the best improvement is to destroy yet another town centre landmark, whilst also seeming to have forgotten or been too busy running down Sheerness to have noticed that Shurland Hall is under offer for 1.5 million. So I can't really form a constructive understanding of his thinking. There are many facts he is obviously unaware of regarding the water tower that will soon come into light, from everything from past planning applications to approved and stamped requirements. Whilst not saying too much at the minute, I hope in the very near future to see a change of attitude. No doubt even if it became a burnt out shell there would still be those campainging to keep it that way, given the derelict state of parts of Sheerness in the name of posterity I often wonder why the Council don't hire the town out as a film set for war films. Sometimes people have to accept that some buildings/areas have to move on with progess. There was a time when the Trinity Road area was a series of lovely fields on the edge of Sheerness, which were then built on and spoilt to create first the Council buildings and then Trinity Road itself, presumably people in those days were happy to see these developments because it meant improved conditions. That is now about to happen on the same site and for the same reasons, why is it so hard to accept this time round. There's no doubting that Sheerness badly needs cleaning up but it won't happen by hanging on to derelict, overgrown sites and memories that aren't going to re-occur anymore than we are going to grow younger. If I had my way, we would put new housing on all these old sites, making Sheerness look clean and tidy again and at the same time stop developing on the fast diminishing countryside outside of the town - that's where preservation energies should be spent!